Affordable housing Lagos Nigeria - It is true that housing in Lagos Nigeria has taken a new dimension with property prices skyrocketing beyond the reach of the average Lagosian. That notwithstanding, you can still find affordable housing in Lagos Nigeria. writing, 3 bedroom flats in Ogba area of Lagos have rental price of between 300,000 - 500,000 Naira per annum. That is not affordable for a lot of people because the majority of people in Lagos are barely surviving. However, that does not mean you cannot find affordable housing that is within your budget in Ogba if your budget is, say, 200,000 Naira per annum. 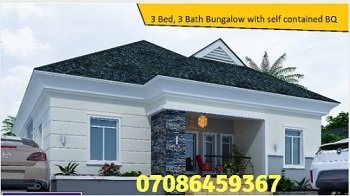 You can still find cheap housing that meets your budget even if you cannot afford 300,000 Naira per annum for a 3 bedroom flat. There are several options open to you. 1. You can choose to rent a 2 bedroom flat instead of a 3 bedroom flat. 2 bedroom apartments are usually cheaper than 3 bedroom apartments. For example, in Ogba area mentioned earlier, while a 3 bedroom apartment will go for between 300,000 - 500,000 Naira, a 2 bedroom apartment may go for about 200,000 to 350,000 Naira. So, by choosing to lower the number of bedrooms you choose to rent, you're reaching for affordable housing . . . housing that is within your budget. do but don't have the budget to match your want, sticking with a smaller apartment pays you. 2. You can choose to rent a 3 bedroom flat in a small house if you believe you need a 3 bedroom flat and can't make do with a 2 bedroom flat. A smaller house falls into the category of cheap housing. This means that within the same location, a smaller house comes cheaper than a big house with the same number of bedrooms. significant reduction in the rent you pay. 3. A third option is to go further down into the interior of the location where you wish to rent an apartment. Generally, houses close to the main road or major intersections cost more to rent or buy. The same goes for Nigeria real estate or properties that are close to a bus stop or commercial area or a rich neighbourhood. By choosing to rent a home in the interior areas of a particular location, you reach out for affordable housing. That means, you pay less for the same size of apartment. From the above, it is obvious that with a little creativity in choosing your housing options, you can get fairly cheap housing even within an expensive area. That brings us to option four. If you're that kind of person who cannot accept a small house and you're tight on budget, you have the option to live in the outskirts of the city. Properties in the outskirts of Lagos are cheaper to rent and cheaper to buy. For example, as at the time of this writing . . .
See the difference in prices? It is still a bungalow. But the price varies widely with location. So, whether you're buying or letting, the farther away you move from the city centre, the cheaper the house. Now you have the four options. Buy or rent the house that fits your pocket.